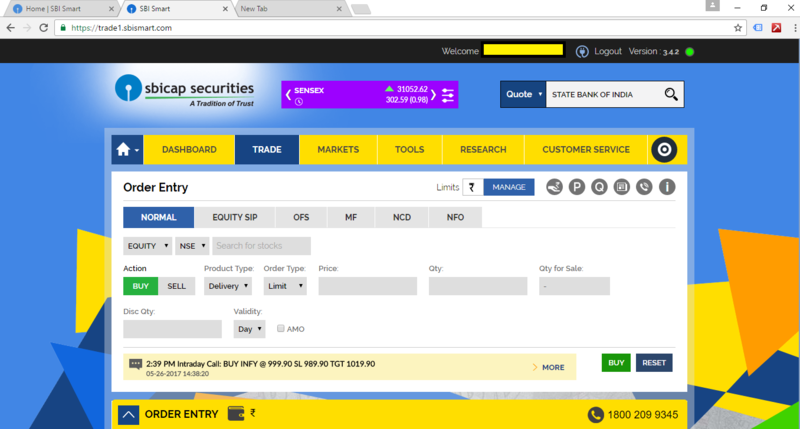 How to buy a stock using SBI demat account? State bank of India is one of the biggest public sector bank in India. After the merger of the SBI with its associate banks (State Bank of Bikaner and Jaipur, State bank of Hyderabad, State bank of Mysore, State bank of Patiala and State bank of Travancore), SBI has entered the league of top 50 global banks with over 500 million customers and 22,500 branches. Because of this huge number of customers in state bank of India, the number of demat and trading account holders in SBI are also high. 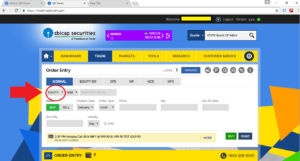 However, many of such users do not know how to use their demat account yet or are in process to learn how to buy a stock using SBI demat account and use it for trading. 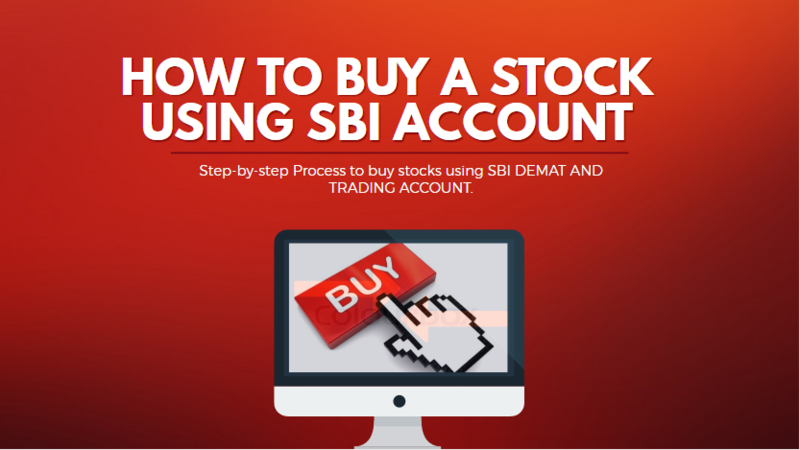 Therefore, in this post I am going to teach you step-by-step procedures about how to buy a stock using a SBI demat account. So, be with me for the next 10-15 minutes to expertise the skills of how to buy a stock using SBI demat account. Further, this post is divided into three sections- Pre-Research (Things to do before buying a stock), How to open a SBI demat and trading account and how to buy a stock using sbi demat account. 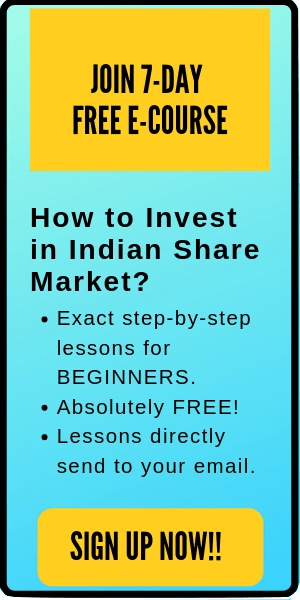 I will advice the readers not to skip any section and read step-by-step to get the full understanding of how to buy a stock using SBI demat account. 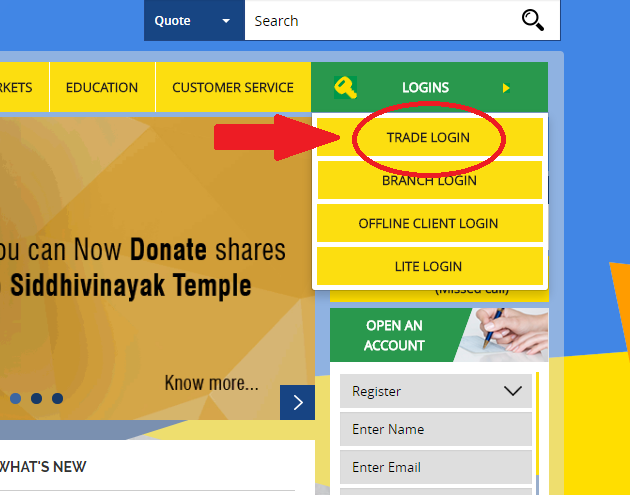 After reading this post, you will be able to easily start trading using SBI demat and trading account. Pre-Research and Things to do before buying a stock. Buying stocks are easy when you know what to buy. The common advice on the stock market is ‘Buy low and sell high’. But the problem is that no one explains how much is low and how much is high. Overall, the procedure to find an undervalued stock is not that easy. However, just like playing the guitar, stock market investing is also an art which has been learned with practice and patience. Practice is required to expertise the subject. Patience is required to safeguard yourself from witnessing losses. There are over 5000 companies listed in Indian stock market. And among these, you need only 5-6 stocks in your portfolio. Never rush to buy a stock without doing the proper analysis. That’s why both practice & patience is equally required to become successful in the stock market. The first step before buying a stock is to figure out how much you want to invest. Keep in mind that you should always invest the additional cash left over after meeting all the day-to-day requirements. In addition, do not invest if you require the money in near-future. For example, do not invest the money that you need to pay them for your kid’s next semester tuition fee. You do not want to risk your child’s future for the short-term market gains. Second, research the company carefully before investing. Remember, you should always invest in companies, not stocks. There is a company behind every stock and if the company is constantly performing great, the stock will also give good returns over the long term. Start with getting the basics ideas about the company like what products/services the company provides, what is the recent growth of the company in its sectors, who are the major competitors of the company, how bright is the future of the company etc. Read the financial statements like balance sheet, income statement, cash flow statement etc of the company in detail. Compare the financial ratios with the peers. Although, there are a number of factors that should be considered before investing in a company in share market, however, few key financial ratio analysis are listed here. Dividend Yield – Depends on Investor preference. Regular dividends for last 5 years favored. After studying the financial ratios, and if it meets the above-mentioned points, analyze the companies financial statements in depth. Look at the sales, profits, revenue etc. A constant growth in these over last 5 years should be favored. Lastly, find what this company is doing that its competitors are not which will give it an advantage against other companies in its sectors. Once, you have studied the company carefully and are satisfied with its performance and expected future growth, then you can proceed further. How to open a SBI Demat and Trading Account? My friend recently opened an SBI Demat and Trading Account. It’s super simple and hassle-free. 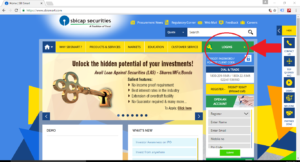 The whole procedure to open your trading and demat account take around 15 days. SBI also offers 3-in-1 account i.e. 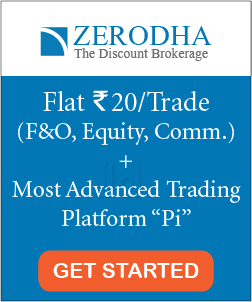 Saving+Demat+Trading account. For opening your account, first, you need to call on the number provided on the SBI’s contact page. You can know the charges to open the account and other details on the same customer care number. Here is a link to the page: https://www.sbismart.com/contact-us On calling the support number, the customer care will ask for your details and the suitable time to meet you and bring the account opening form for getting signed. Step 2: Enter your login details. You will need your ‘Client Code’. ‘Password’ and ‘PAN Card’ to login. You will get these details via email, once your account is opened. If you are first time user, then SBI will ask you for a one time password with ‘Client code’. You will need to change to a new password after entering. Step 3: After you logged in, you can notice the menu on the top ‘Dashboard/ Trade/ Market/ Tools/ Research/ Customer Service’. Click on ‘Trade’. This will open the ‘Order Entry Page’. Click on ‘Manage’ in Limits to transfer funds. Step 5: After clicking on ‘Manage’, the ‘FUND LIEN’ Page will open. Now, click on the ‘FUND LIEN’ option on the right to as shown below. 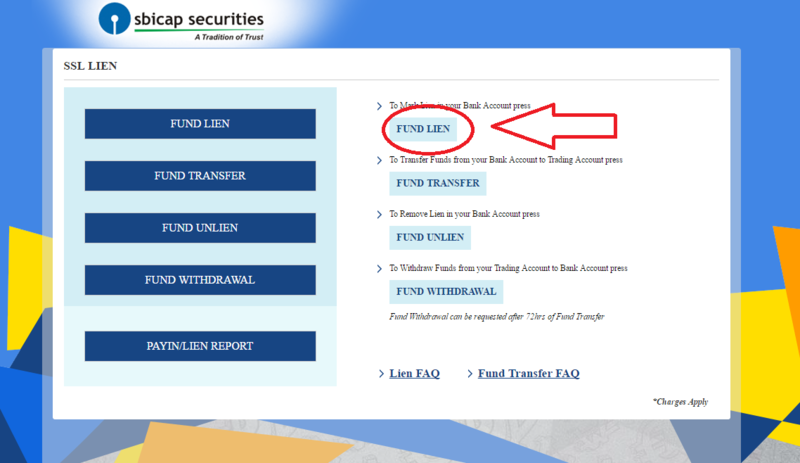 Please note that there is also an option of ‘FUND UNLIEN’. This is used in the case when you transferred more amount than required to your demat account or when you couldn’t buy the stock. In these cases, you can transfer funds from ‘Demat’ account to your ‘Saving’ Account using ‘FUND UNLIEN’. Next. it will redirect you to the NET Banking page. Enter your login credentials (Username and password) and then complete the payment. 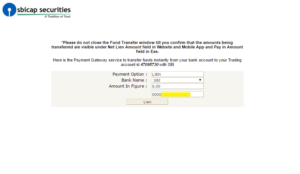 Step 6: After completing the Step 5, you have transferred the funds to your demat account. 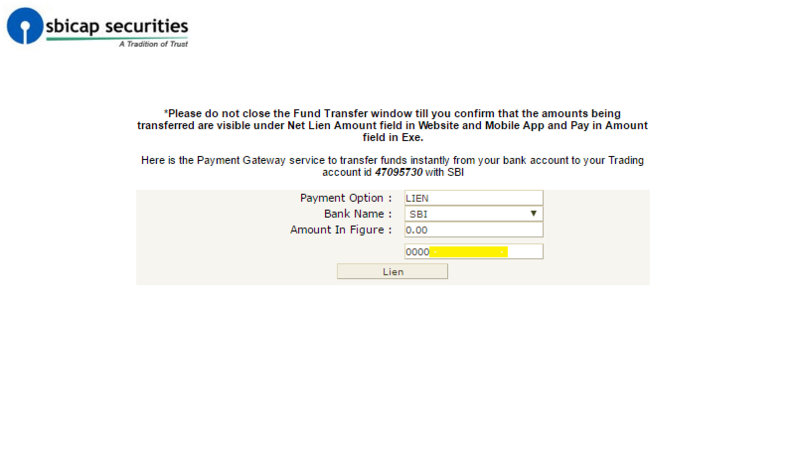 You can check the transferred fund by going to ‘LIMITS’ on ‘TRADE’ page and viewing the ‘Net Lien Amount’. This will be equal to the transferred amount. Select Equity (By default it should be equity. However, if it not, then select ‘Equity’). Then select the preferred ‘Stock exchange’ beside ‘EQUITY’ Option. There will be the options of NSE (National Stock Exchange) or BSE (Bombay stock exchange). 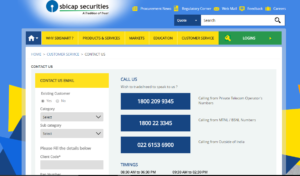 Select either NSE or BSE. It doesn’t make much difference which stock exchange you choose. Both are almost similar. 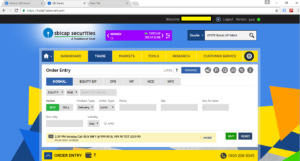 Besides the stock exchange, enter the name of the stock you want to buy and click on ‘GO’. For example, if you want to buy NHPC (National hydroelectric power corporation), then enter NHPC in the blank provided. After clicking on ‘GO’, the ‘market price’ of the entered stock will be shown along with the ‘bid’ and ‘ask’ price. Notice the market price carefully and decide whether you want to buy that stock or not. Next step is to choose the ‘Order type’. There are two types of order type- ‘Market’ or ‘Limit’. The ‘Market’ order type will buy the stock at the current market price. For example, if the current price of NHPC stock is Rs 30.20 and you want to buy this stock at that market price, you should select ‘Market’ option. Further, please note that the market price fluctuates too fast and it might change till the time you click on ‘BUY’. Therefore, decide quickly if you want to buy on the ‘Market Price’ or not. The second option is ‘LIMIT’ option. Here, you can select the amount at which you want to buy the stock. 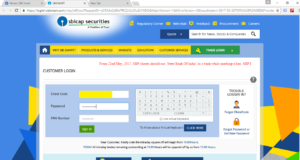 For example, if you want to buy the NHPC stock at Rs 29, then you can place the order type as ‘LIMIT’ and enter the price of Rs 29. Further, please note that its easier to buy stocks at ‘Market’ price as there are many sellers at market price at that moment of time. However, the sellers might not agree to sell their stocks at the ‘LIMIT’ price you are asking. In this case, you might not be able to buy the stocks. When placing a ‘LIMIT’ order type, place the limit amount logically by following the trends. 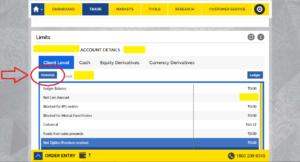 After selecting the order type, enter the ‘Quantity’ (QTY) of the stock you want to buy. For example, if you want to buy 10 stocks of NHPC, then enter 10 in the QTY option. Step 8: After clicking on ‘BUY’, a confirmation page will appear. Click on ‘Confirm’. After confirming the order, you have successfully placed your order. You can verify this by going to ‘ORDER BOOK’ present on the same page. Scroll down to the ‘TRADE’ page, and you will find the ‘Order book’. 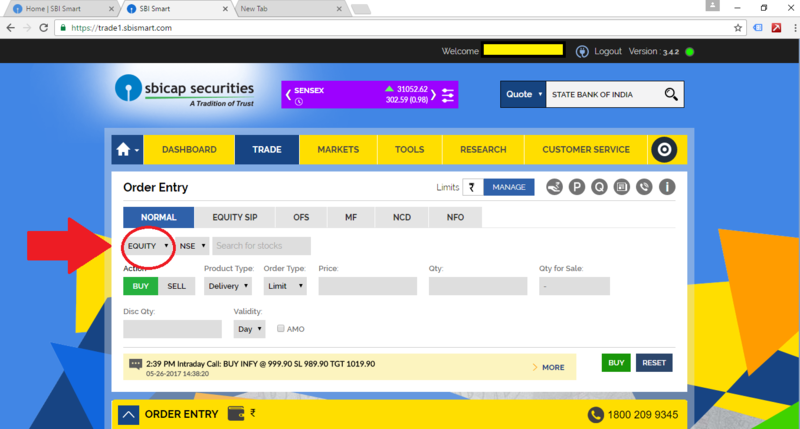 Once the order is successfully completed, you can check the stocks bought at ‘TRADE BOOK’ option, present on the same ‘TRADE’ page. That’s all! You have finally bought the stocks using SBI demat account. Congratulations!! !